SEATTLE — Although high volume snow is a rarity in Western Washington, upcoming forecasts predict that many could be snowbound again this weekend. Emergency preparedness is the first step to ensuring that those affected by inclement weather are safe and equipped with snow and ice defense essentials. “Braving the elements can prove to be a hefty undertaking but with the right tools, travel is possible. Before weather hits, gather the following last-minute essentials for a comfortable, snowy weekend. 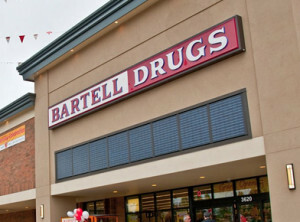 With 66 full service locations, Bartell’s will operate regular business hours; ready to assist those in need of items to remain connected, fed, warm and protected,” said the retailer. “For many, Bartell’s is within walking distance and can be a resource for most items listed above during the storm,” the company added.